Proof liberty seated quarters were minted in substantial quantity at the Philadelphia mint each year from 1858 to 1891. There are a few, quite rare, earlier proofs and a handful of branch mint proofs which are excessively rare, but the vast majority of seated quarter proofs are Philadelphia mint issues from 1858 to 1891. There were 35 distinct proof issues during that time period, if one counts the 1873 with arrows and no arrows as two different issues. A comparison between proof and business strike Philadelphia mint quarters reveals an interesting pattern which is paralleled in other seated denominations. There are frequently more proofs available to collectors than business strike coins from the same year. This is most notable in the very low mintage years of 1864 -1870 and 1879-1890 in which production of coins for circulation never reached the 100,000 piece level (one year as low as 5,000) and proofs were made at a rate of from 470 to 1355 pieces. This presents an interesting questions for the seated quarter variety collector – namely to include the proofs or not. The business strike quarters for these years were struck from one, or for a few issues two, die pairs in each year. The proofs, with one exception, featured a single die pair each year. So as a collector of these Philadelphia quarters the recurring question becomes, “Is this the proof die pair, or the business strike die pair?” The answer is not always simple to determine, particularly for mint state business strikes, which frequently are found proof-like. The question can also carry significant financial implications for collectors, as the business strikes are often far, far rarer than the proofs and priced accordingly. Ask anyone who has mistakenly purchased a proof 1873 no arrows closed 3 at the price of a business strike. Distinguishing proof from business strike is also made more difficult by the fact that proof dies were sometimes used to make business strike coins. This has been documented in the case of both 1852 and 1883 quarters. The 1852/52 obverse die was used to strike the 1 or 2 known proof examples, as well as a number of business strike coins. The 1883 used distinct obverse dies for proof and business strike issues, but the same reverse die was used for both. Now we get to the point of this story. Yes, there is one. Last November I had the privilege of spending some time at the LSCC table at the Baltimore Coin and Currency Convention along with the owner of the Greenwich Collection of proof seated quarters and many of the coins from his collection. The collection features not just one, but two high-grade proof 1868 quarters. In addition, another collector had a mint state business strike at the table and I had my example, as well. A careful examination of the four coins revealed that my example was in fact a previously undocumented mule; a combination of the proof obverse with the business strike reverse. The attribution points for the four dies are: Briggs Obverse 1 (Business Strike Obverse): date position 8/9 date sloping down from left to right; Briggs Obverse 2 (Proof Obverse): date position 7 with date sloping up from left to right, 1 repunched north, last 8 recut inside top loop, large die lump attached to B in LIBERTY; Briggs Reverse A (Business Strike Reverse): recutting on Q and OL of denomination, distinctive pattern of die scratches between vertical shield lines; and Briggs Reverse B (Proof Reverse): vertical lines 2 and 7 extend to horizontal line 2. 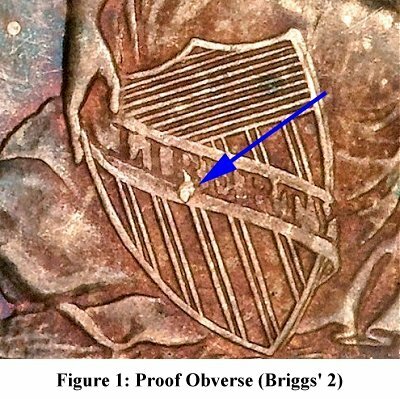 Briggs Obverse 2 (Proof) is shown in Figure 1. Note the large die lump near the B in LIBERTY. 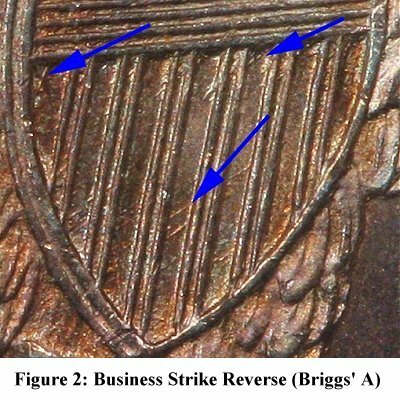 A close up of the shield from Briggs Reverse A (Business Strike) is shown in Figure 2. Note the obvious die scratches within the vertical shield lines.